We take a personal approach to homebuilding. Here, you are not just a number. You are a valued customer, and we strive to make you feel that way. MLM Homes is dedicated to helping you find the home you desire in a location that fits your family's lifestyle. Whether you are FIRST-TIME home buyer, interested in one of our excellent current models or want to design a CUSTOM home of your own, our friendly staff will help you make your dream a reality. Want to experience the excitement of living in the City? Or maybe you're looking for a larger space in St. Louis County or St. Charles county? MLM Homes has you covered. We offer affordable, customized housing throughout the St. Louis Metropolitan area. New Construction - We have a variety of existing models to choose from, depending on the lot. Rehab Projects - We can assist with just about any project, from total gut rehabs to new room additions, and aything in between. Custom Homes - Have an idea of your own? We can help you make it happen. Site Selection and Acquisition - Need help finding a lot? No problem. We'll take care of it. FIRST-TIME HOMEBUYERS: We have new home floor plans that will fit just about any size or shaped lot, all of which have pre-established pricing! CUSTOM HOMES: We can build on our lot or yours. Give us a call! 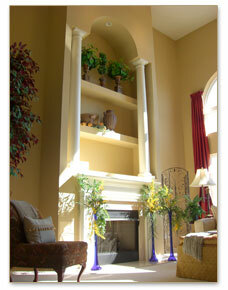 We would love the opportunity to provide a FREE estimate on your custom home.